The DOE data table only goes through 2001, but the “progress” looked pretty linear, so I made a graph to see where the trend might be heading. It’s kind of frightening. 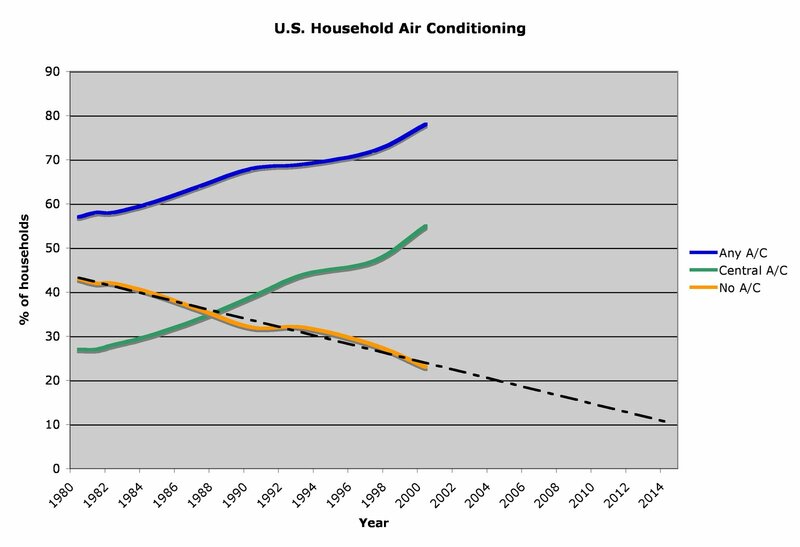 If things continue on this course, the A/C-free American house will be virtually extinct within 10 years. Wow. I can only interpret this in two ways: Either (a) we are getting as intolerant of summer heat as we are of winter cold, and adding extra A/C just to keep up with our own growing demands for “comfort”, or (b) the climate is actually getting warmer, and we need more A/C just to keep houses the same temperature they used to be without A/C. Possibly both. And since (a) might cause (b), and (b) might exacerbate (a), it looks like a bad combination. This entry was posted on January 3, 2009 at 6:51 pm and is filed under Hard data, Summer cooling. You can follow any responses to this entry through the RSS 2.0 feed. You can leave a response, or trackback from your own site. I think that neither (a) nor (b) has anything at all to do with it. More and more Americans now have 30+ inch televisions too. This is not because our eyes have grown weaker. It is because the prices of consumer appliances and electronics have decreased or stayed relatively constant as income has risen. As a result, such devices — which used to be reserved for the wealthy — are now within reach for the masses. People have air conditioners because they can. That’s it. No magic. Okay. That’s true. Maybe people get one because they can… but then it seems to become a necessity.And it still doesn’t explain why I don’t have an air conditioner. Except that I’m a whacko crank. I think it’s a little of A – that what the general population perceives to be comfortable or normal internal temperatures has changed dramatically in the last 50 years. We want warmer houses in the winter and colder houses in the summer than our parents or grandparents had.But I think it also has to do with the cost of fuel. The low cost of fuel has made air conditioners affordable to most. And so the third factor I think is the keeping up with the Jones’. With air conditioners becoming common place, people start to look at you strangely if you don’t have one. People have certainly said to me – why don’t you get one – you can afford it…. No one wants to look like they can’t afford something.Here are some reasons why despite all that, I choose to not have an air conditioner (even though we have days in the summer of over 40 degrees Celcius)….1. I think going from a cold building to a hot outdoor temperature isn’t healthy. It’s a shock to the system and it makes the hot of the outside feel even hotter than it is.2. Air conditioners mean closed windows. Yuck. After having the windows closed and no fresh air in the winter, why on earth would I want that in the summer too. There is something so wonderful about summer breezes. I’d never want to shut them out3. The emissions. There is a huge carbon cost to running air conditioners. Given I’m trying to reduce my carbon footprint, this alone is reason enough for me not to have one4. The cost. Sure I’ve got money to pay for an air conditioner. But why would I put money into that when it could be spent on a great dinner out at a local restaurant or saved for my dream off-the-grid house. :)Phew! That’s a long comment! We have AC but never use it. It will help us sell our house though – people really look for it. Don’t forget…pre 1980 was before computers were around. As computers moved into businesses they were told the office equipment had to be kept cold. The workplace became air conditioned at a lower temp than before. People get used to a “comfortable” temp at work and want it at home too. Now we also stuff our homes with electronics that all put off more heat(even on standby) so we want it cooler!!! !